Methyl B12 includes a concentrated and bioavailable source of two key B vitamins: B12 and folate. This synergystic blend quickly boosts tissue and brain levels to support numerous systems in the body. Methyl B12 includes a concentrated and bioavailable source of two key B vitamins: B12 and folate. 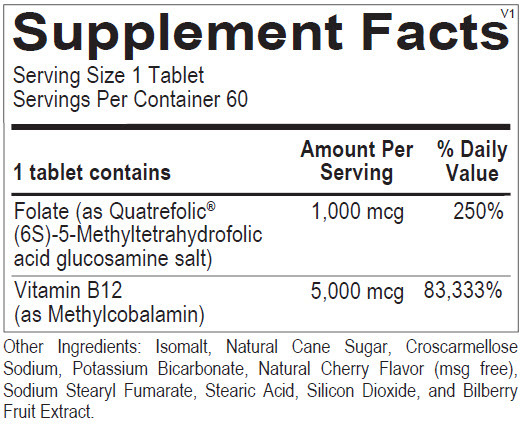 Each tablet provides 5,000 mcg of methylcobalamin and 1,000 mcg of folate as Quatrefolic -100% 5-MTHF. This synergistic blend of methyl-donating B vitamins quickly boosts tissue and brain levels to support numerous systems in the body. As a dietary supplement take one tablet daily, or as directed by a health care professional.